And another legendary politician has passed away today, April 8th, 2013. Former British Prime Minister, Margaret Thatcher, died at the age of 87 years. Needless to say, the feisty politician, who was dubbed the “Iron Lady” by a Soviet Journalist, made tremendous inroads during her tenure as Prime Minister. She was a stubborn, determined entity and it goes without saying that her presence in the political arena paved the way for female politicians around the world to make their mark. The quote in the above picture made me smile. 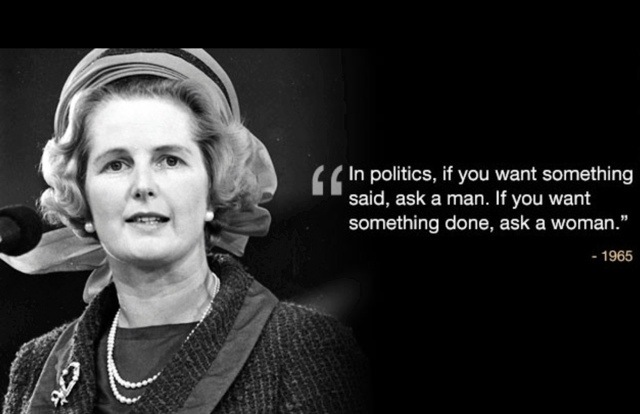 And, although we have indomitable male forces in the political world, I have to say that this quote pretty much rings true. So, to Prime Minister Margaret Thatcher, may we say one resounding and final thank you to you for gracing and inspiring us with your indomitable spirit. May you Rest In Peace. No finer ally has the United States had since Sir Winston Churchill, both in war and peace. Both President Reagan and Bush depended on her sound, level headed advice during a perilous time in world history. KT McFarland who worked under the secretary of defense during the Reagan administration, relates a sound piece of advice given her by Margaret Thatcher. She told her, as a public woman, never leave home without a second dress or suite; advice which she took to heart and presumably follows. Margret Thatcher and her type that were grounded in fundamental principals will be missed and we will be the poorer for her passing. Yes, indeed. Gene. She is the stuff of legends. She will be sorely missed – what a strong, determined, focused woman! Hard to live up to I would think. She was one in a million. Tough! Stoic!